This beautiful desert annual is indigenous to the deserts of the south western United States, but it does remarkably well in non-desert regions as long as it is given well-draining soil and very little water. It tends to die off after the first frost but may grow new plants in the spring if it sets seed on bare ground. The deep golden flower is offset beautifully by the gray, delicate leaves. 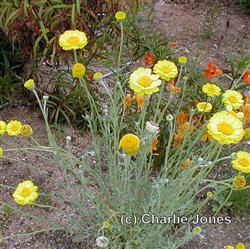 Desert Marigold grows to about 2' high and 2' wide. It provides abundant color in a desert or rock garden. We are testing its suitability for container/patio planting.